Your air conditioner's evaporator coil (the ‘inside’ portion) and condenser coil (the ‘outside’ portion) collect dirt over their months and years of service. A clean filter helps prevent the evaporator coil from soiling quickly, however in time, the evaporator coil will still collect dirt. This dirt reduces air flow and insulates the coil, reducing its ability to absorb heat, thereby decreasing the efficiency of your unit and causing it to work harder than it was designed for. 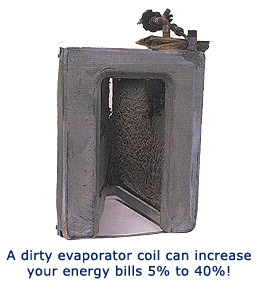 To avoid this problem, check your evaporator coil every year and clean it as necessary. 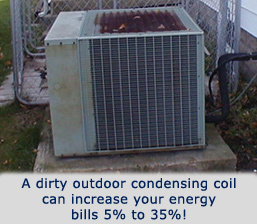 Outdoor condenser coils can also become very dirty if the outdoor environment is dusty or if there is foliage nearby. You can easily see the condenser coil and notice if dirt is collecting on its fins and/or spines. You should minimize dirt and debris near the condenser unit. Your dryer vents, falling leaves, and lawn mower are all potential sources of dirt and debris. Cleaning the area around the coil, removing any debris, and trimming foliage back at least 2 feet allows for adequate air flow around the condenser unit. The aluminum fins on evaporator and condenser coils are easily bent and can block air flow through the coil causing all kinds of problems with the unit. If bent, try to straighten these fins back into nearly original condition (they don’t have to be “perfect”, just open them up to air flow again).